Requests for Kindergarten Class 100 Postcards & WWII Veteran Turning 93 Early Birthday Cards is our letter writing focus on this Friday morning. First, there IS time to participate for sending a postcard to Minnesota and a Birthday card to Oklahoma. In addition, both of these requests are by two of my Pen Pals. Both are participating in InCoWriMo 2019. In fact, it is wonderful already hearing from each of them this month via snail mail! My handwritten letter replies are already on my calendar for February 11 and 12 respectively for writing back. It is a delight to share this email request via Jackie Flaherty. 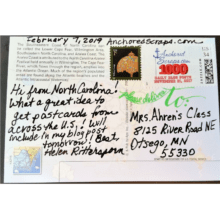 Check out her latest Letters & Journals blog post – Postcards for Kindergarten Class (February 7, 2019) from yesterday for full details. I’m loving reading the class is “… putting our postcards up around a United States map and marking on the map where each came from. It’s a pretty cool display! It could be so much better if we could significantly increase the number of postcards on our wall.” The name and address details are emphasized in bold by me. I’m including here the front and back of the postcard I sent out this afternoon, dropping it off at the Post Office. Because they are tracking on a map of where the postcards are originating. 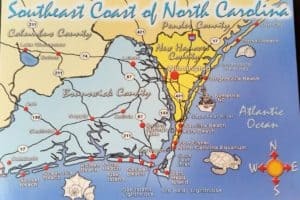 The postcard I sent is of a map of Southeastern Coast of North Carolina. 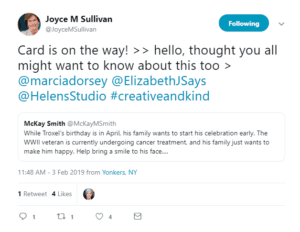 Earlier this week on Sunday, I was reading Joyce Sullivan Tweet 3 Feb 2019 11:48 AM; she was helping to spread the social media word about the request. It references this Tweet 2 Feb 2019 4:16 PM – from McKay Smith‏. The bold emphasis added by me. That Tweet links over to the News Channel 5 Nashville article. In conclusion, my letter writing suggestion is to ACT now. 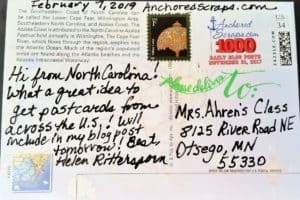 Write the postcard, send the Birthday card, and put into the mail. This way allowing plenty of time for mailing and not forgetting. The image I’m showing is of my postcard I put into the mail at the Post Office yesterday to Minnesota! My sincere thanks to Jackie, and to Joyce for proactively getting the word out helping letter writing enthusiasts! Join me tomorrow for my Saturday blog post! P.S. Day 8 of InCoWriMo 2019!